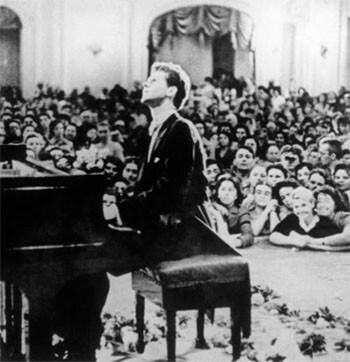 Born Harvey Lavan, Jr., Van Cliburn was a tall soft-spoken Southern gentlemen who became one of the great American heroes of the 1950s. Just look at the admiring ladies watching him play in the photo above. When he traveled to Moscow in 1958 to participate in the First Tchaikovsky International Piano Competition, little did we know that he would win the First Prize, launching an international career that would go on for decades. Then of course, an international competition was begun in his home town of Fort Worth, Texas, and it has continued for over 40 years. 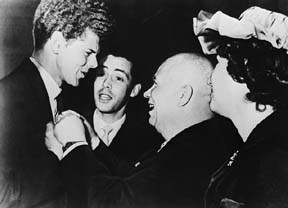 Here's a photo that shows that when former Russian premier Nikita Khruschev was not drinking mass quantities of vodka or banging his shoe on the table at the UN, he was embracing Van Cliburn. Our microphones caught up with Cliburn several years ago when he was exploring the idea of a classical comeback. He was in the penthouse suite of the Fairmont Hotel in San Francisco, and he spoke with us for a few minutes about music, the experience of winning the Tchaikovsky prize, his brief sojourn into conducting and other musical subjects. The interview runs a little over 12 minutes. Listen!